My Anet A8 bed mosfet has blown up – what now? I have been asked about this question about the anet a8 bed mosfet a few times now. So my advice was to add an external mosfet and use the output of the controller to switch it on and off. Thanks to GearBest my order of spare main boards was delayed until a few days ago, and my printer is normally on the go – so I didn’t want to strip it down. 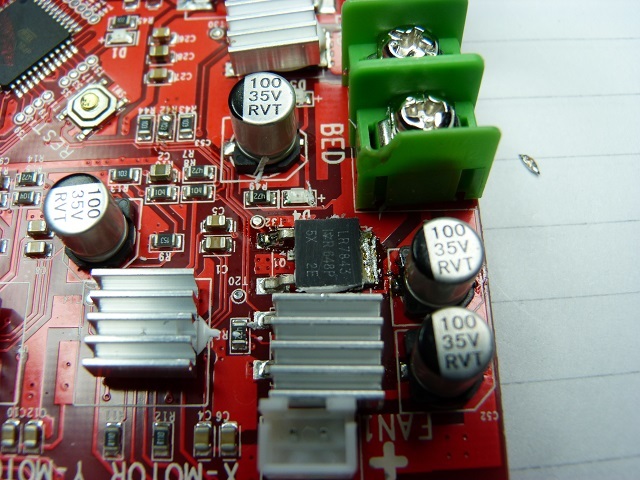 So the first thing I did was to run a new main board up with a power supply – to test it. I was under the impression that you could run the whole board off the usb, same as the mega. But this is not the case you need power to the board from the 12v dc input. Now getting the computer to recognise the board was easy – with the ch340 driver installed. Connecting through the serial port at 115k baud the computer recognised the board in pronterface , but the ‘printer’ was not working – it had errors. You need to connect the two thermisters, one for the bed and the other for the hotend before you can fool the board into thinking it is a working printer. So with these now connected, I was able to switch on and off the bed with pronterface. Switching it all off and now connecting the external mosfet as I had described in an earlier post. Connect the control wires across r42, the gate resistor for Q1 the bed mosfet. First thing I had to do was find r42, the second was to solder wires either side of it. Being an 0805 surface mount resistor you don’t have much space between the pads of the resistor, but it is possible to solder either side of it. Note: an easier place to connect the wires is across the bed mosfet – the two legs are the same terminals as the resistor and wider spaced. Wiring in the supply to the mosfet board and putting a load on it of a car led indicator lamp – closest thing I had to hand which worked at 12v easily!, I switched it all back on. Reconnecting the computer I switched the bed on and … nothing- no light – the onboard mosefet switched on but not the external one. Ok so what is wrong. Looking at the circuit, the control voltage goes through a full bridge – to make it polarity independent. This will take 0.6v off either pin – so from the 5v controller output you need to subtract 1.2v – we are left with 3.6v. This is fed through a 10k resistor (R5) to the opto device to pass current through a led – this in turn switches on the opto transistor, eventually switching on the output mosfet. The point of this is, that with 12v on the control input there is enough current through the led to activate the device, but with 5v there isn’t. Calculating the current through the 10k resistor with 12v ( (12-1.2- 1)/10k= 1mA) and with the 5v input ((5-1.2-1)/10k= 0.3mA) we can see why the opto switch is not working. Note the extra 1v drop in the above equation is for the led internal to the opto device. So working it the other way round – we need a minimum of 1mA to operate the opto device we can use the voltage to calculate the resistor value. To have 1mA flowing and calculate the resistor value we divide the voltage by the current. I am very lucky to have an 0805 resistor kit, so I looked through this and found the closest value was 2k7 (preferred value). Removing the fitted one and replacing it with the 2k7, reconnecting and switching the bed on and off it worked. So if your anet a8 main board has blown its bed mosfet you have three choices. buy a new main board – be it ramps and mega or standard replacement. 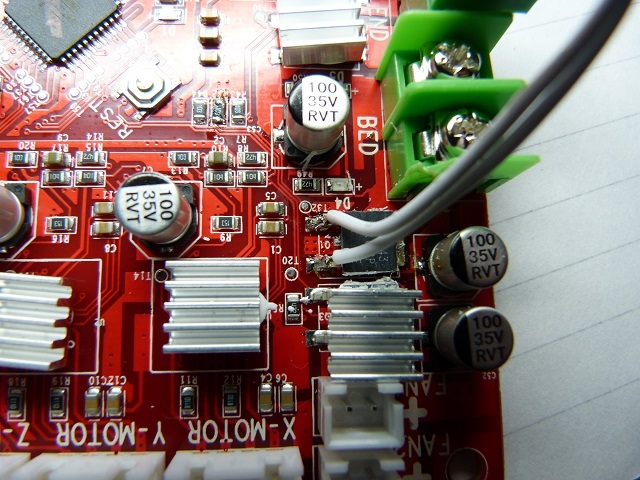 Replace the Bed mosfet(ebay link)– see below for directions on how to do this easily. Replacing the onboard mosfet easily. Note: remember these devices are static sensitive – pick up the device and then touch the board with a finger to get both the board and device to te same potential- reducing the chance of it blowing up! I have just been reminded that you need to know the device number to replace it! The device is an IRLR7843 mosfet. Can be obtained ebay sources in the UK or elsewhere dependant on time scales. The onboard bed mosfet is located where the designator says Q1. It is under the silver heatsink. This heatsink is held in place with thermal silicon adhesive. To remove this heatsink, take a flat screwdriver and carefully lever the heatsink away from the device. This may pop off easily or be very difficult. 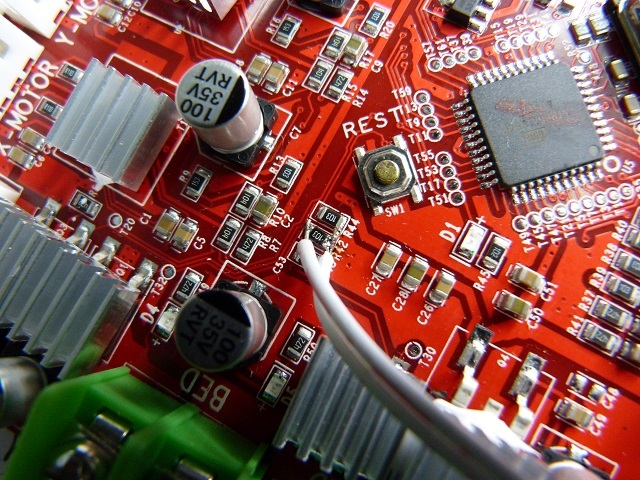 If you use the board as a lever by the green connectors it is controllable – but be careful you don’t damage the board. Once this is off you can see the device is held down to the board with two legs and the back pad. To remove this device easily – carefully cut the legs of the device close to the package. Use a soldering iron to remove the cut legs- don’t damage the pads on the board. 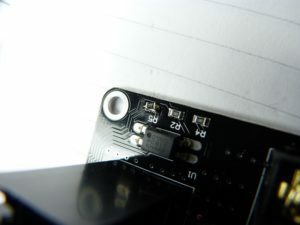 To remove the main body, hold the tip of the soldering iron against the metal tab at the top of the device and feed a bit of solder onto the iron. You will see the solder flow onto the tab of the device – when this happens it is ready to be removed. Use a pair of tweezers to lift the device off the large rear pad and you have done it – congratulations. All you have to do is to clean up the large pad – make the solder flat – and replace the device with a new one. To remove the solder from the pad I use solder wick. To use this lay the solder wick over the solder you want to remove and press on top of this with the soldering iron, you will see the solder melt and flow into the solder wick. Remove the solder wick from the area before the solder solidifies. If the solder solidifies then remelt the solder with the soldering iron and remove it quicker. Remember that this wick is copper and it will conduct heat – so keep your fingers a little away from where you are going to remove the solder. Or get asbestos fingers! Melt a little solder onto the large pad. And I mean a little. Place the device onto the pad and heat the tab. Feed a little solder onto the iron while it is in contact with the tab and the large pad to assist reflow. When the solder melts then position the device carefully with tweezers – making sure the two legs are on the correct pads, remove the iron. Solder the two remaiming legs to their respective pads. Now all you have to do is to glue the heatsink back on with this thermal compound. Now test the board – without loading it with the bed to start with. So there you have it – how to replace your bed mosfet and how to wire in an external mosfet if your anet a8 bed mosfet blows! It sounds complicated but really isn’t. If you have a go at replacing your Anet A8 bed mosfet and have problems then why not comment in the box below and we can try to sort the problem out.